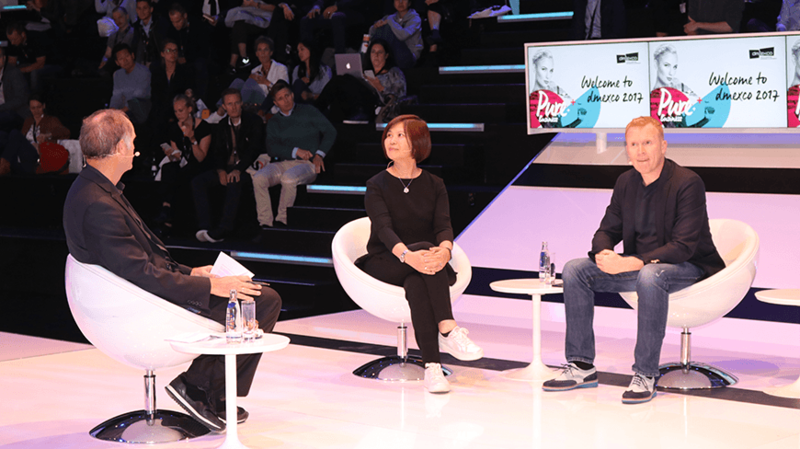 In a session at dmexco, the leading digital marketing exposition and conference in the German city of Cologne this week, Isobar’s Global CEO, Jean Lin, and Kris Beyens, VP Operations EMEA, eBay, revealed the inside track on engaging and transacting with Digital Natives today. To a packed international audience, the pair took to the Debate Hall to highlight how it is both through the smart combination of data-informed marketing strategy, creativity and the right technology partners that will give companies the competitive edge in the experience economy. They laid out the complexity of the current landscape: the pace of change of media consumption and commerce is being warped by technology at a blistering pace, with no sign of slowing down. Jean then shared the four factors that lead to success: understanding the evolution of technology and how it empowers omni-channel experience, integrating online with offline, contextualising data and making it the enabler of these experiences and finally applying a fresh perspective on creativity, as the bigger the technology challenge, the more creative you have to be. Jean gave KFC’s journey with Isobar in China as an example of how brands are changing their approach to meet Gen Z + Gen Y consumer expectations. The agency helped the brand to partner with Baidu, WeChat and Alibaba payment services, using a creative use of digital and data to drive instant transactions and making it possible to stretch promotions. From streaming music by scanning codes available on their food tray, to pre-ordering meals and playing their favourite games: all while enjoying their chicken. Recently, eBay powered searching and shopping with images on mobile devices, launching Image Search and Find It On eBay, a new experience for shoppers to use pictures instead of words to search eBay’s catalogue of 1.1 billion items. Enabled by artificial intelligence and machine learning, these innovative ways to shop will allow people to quickly find the things they love, making the entire internet shoppable on their mobile device. Isobar’s latest example of closing this gap is V-Showroom, an application for GM that merges real and virtual worlds to produce new environments and visualizations in real-time, by using an overlay of augmented content that interacts with the physical space or reality it is in. Jean called out one example of partnering with clients and ultilising new platforms is the blue-infinity Linked by Isobar work, the “Connected Frame” a retail innovation that integrated with Salesforce Commerce Cloud. It was created with long standing client and luxury Swiss watchmaker, Hublot, and featured an augmented reality display case to showcase the latest range and enable the customer to “try on” the latest watch.